U.S. Secretary of State Condoleezza Rice said Thursday she saw hopeful signs that progress was possible in forging peace in the Middle East. U.S. President George W. Bush remains committed to a two-state solution, Rice told reporters in Vienna, calling it "one of the centerpieces of our policy." She said Washington continued to work toward "the establishment of the Palestinian state to live side by side with Israel in peace and security." "I think it has been long enough since Palestinians have wanted and needed their state, and long enough that Israelis have wanted and needed a neighbor that could be a source of security and not a source of threat for them," Rice said. Rice acknowledged the difficulties, but said trends in the region pointed to a "time of opportunity." "I'm not certain that in fact we're further away now than we were at some other point in time. It seems we've been close from time to time," she said on the sidelines of a conference on women's peace efforts in the volatile region. "If this had been something that was easy to achieve, it would have been achieved by now," she said. 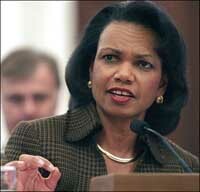 But Rice said she generally has been warmly received in the region. "This is a time, I think, for renewed emphasis on the Israeli-Palestinian issue," she said.